After having spent the last few years stretching stylistically in a few different directions (The “White Walker” single found a home as the lead track for a season of HBO’s Game Of Thrones, 2014’s Once More ‘Round The Sun say the band get leaner and almost blurring the lines between metal and punk rock a bit), there’s something refreshing and exciting about the fact that Mastodon has made a glorious return to the sort of melodic metal with which the band found fame on The Hunter. That is not to say the band has reached the point at which they’ve simply begun to repeat themselves, just that there is an obvious (and welcome) similarity between the band’s fifth and seventh albums;the dynamics are slick and the guitar tones are gargantuan, the songwriting is tight, focused and consistent the whole album through and the production makes the most of Brandon O’Brien’s hard rock-identified style to take the vibes back to Crack The Skye. 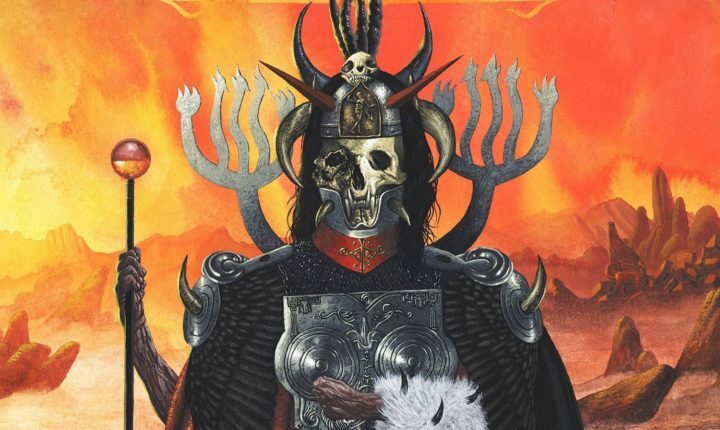 Simply put, on Emperor Of Sand, Mastodon prove that they know where they’ve been before and where their greatest successes have been, and they’ve put all the strongest elements together into an album which could be characterized as their greatest to date because it features everything fans have loved about the band tied down into one package. As soon as “Sultan’s Curse” strides out to open the album, listeners will recognize that Mastodon’s back, and returned just as they hoped the band would. The thick, beastly guitar tone perfectly recalls the interplay between Brent Hinds and Bill Kelliher and that feels instantly satisying but, not content to let the song be just that, listeners will notice some flecks of classic metal caprice in the sound similar to that of Randy Rhoads; there’s some mathy articulation in the guitar tone here which is definitely delicate and, driven as it is by Troy Sanders’ bass and Brann Dailor’s drums, listeners will find it totally unavoidable. Following the incredible start made by “Sultan’s Curse,” listeners will already be perched precariously on the edge of their collective seat, but the cool thing is that Mastodon goes out of its way to keep them there for the duration of Emperor Of Sand‘s running by regularly just hammering out one golden brick after another. “Show Yourself” routes a great path between metal and alt-rock which doesn’t actually lighten up just to make the combination easier to palette; in a way similar to how Jerry Cantrell used to balance both strains in Alice In Chains back in the Nineties, the grunt and roar of the guitar performance in “Show Yourself” is tempered by the song’s production and arrangement as well as the vocal. Conversely, “Steambreather” is all stampeding menace and bombast guaranteed to get listeners throwing their fists in the air with horns up, and “Roots Remain” and “Word To The Wise” follow a similar formula which will keep them there. It is for those reasons listeners will be held hypnotized in the early through mid-playing of the album but, as the album progresses, the music does get a little more diffuse and may threaten to lose a few listeners thanks to a couple of guest spots which just really didn’t need to get made (Kevin Sharp of Brutal Truth shows up and doesn’t really add anything to “Andromeda,” while Neurosis’ Scott Kelly actually softens “Scorpion Breath,” somehow, with a performance which could only be called uninspired) but, happily, Mastodon does make one last dramatic pass in the form of “Jaguar God” which partially reprises the band’s softer side a la “White Walker” before just burning the whole thing down to close it. Some fans and critics may complain that the last fifteen minutes of the album’s running really threaten to diffuse the power presented by first two thirds of its runtime but, really, as denouements to any dramatic arc go, Emperor Of Sand‘s isn’t bad. True, it could be argued that the album would have been much stronger without any outside help or “guest assistance,” but it’s easy to ignore those slight foibles when the rest of an album’s running is so good – and that’s definitely the case here.